Mid-March usually means the peaks hugging the border of Gifu and Shiga Prefectures are cloaked in a massive blanket of white, but the unusually mild temperatures have caused an early receding of the snow line and a chance to knock another peak off the dwindling list of mountains on the Kansai 100. Tomomi and Baku picked me up at the crack of dawn as we sped through the sprawling havens nestled alongside the Meishin expressway to an off ramp just north of Nagahama city. Mt. Ibuki sat on the horizon, floating on a sea of cloud and looking frighteningly Fuji in her early morning shadows. To the north, our target peak soared vertically, scratching the bottom of a menacing tea field of dark cloud that sat heavy along the prefectural border. I took a barometer reading for reference, silently reminding myself to check back in a hour to determine which direction the millibars would drift. The car came to a halt at the terminus of a deserted forest road. From here, we had three options: a left fork would drop us into a valley where we could access the southern ridge leading directly to the top of Yokoyama’s twin-peaked massif. Straight ahead lie a constricted valley shooting straight towards a gap in the rugged summit plateau, while a third option required a bit of a detour to an adjacent ridge further east. As we discussed the options, a white flatbed truck came flying up the road from the village below, the driver jumping out with a frantic look of concern as he tapped his watch. Sensing the impending scolding, I took charge, managing to say all of the right things to prevent an argument from unfolding. Yes, I ensured him that we would in no way attempt the constricted valley ahead of us and that we would indeed stick tightly to the southern ridge. For added measure, I even showed him our route on my GPS and promised him a visit to his house on the way out to check in. “Inquiries about the current conditions trickle in weekly during this season,” our gruff caretaker admitted, “it’ll be good to hear about the snow conditions”. With approval from the mountain manager himself the three of us skipped along the gravel road, freshly strewn with boulders the size of bowling balls that the melting snow had lodged loose from high above. I kept my eyes peeled upward should nature decide to bowl the next frame while we were traversing through the lane. The end of the road meant the trail climbed up an impossibly steep spur to our left. Tomomi recognized this point during a failed winter ascent the previous year, remarking on how different the scenery looked in the bare season. We knocked off a couple of hundred meters in no time at all, reaching the mountain pass and start of the southern spur only thirty minutes after setting off. It was here that Tomomi had given up her pursuit 13 months ago, and frankly I was surprised she made it that far at all. Yokoyama is definitely not a mountain to be taken lightly, as groups have been known to use the pitched flanks in mid-winter for Himalayan training. 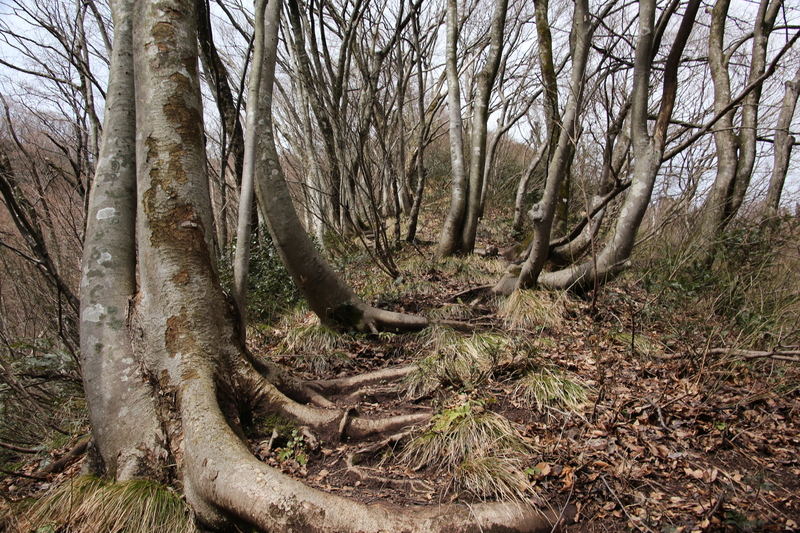 The gradient intensified, requiring not only tricky foot placements but also creative handholds on the bent branches lining the narrow route. One slip here in the mud would send you tumbling, gashing the skin and shattering bones in the process. At the top of a long rise the angle abated, revealing the shoreline of the retreating snow fields stretched out like swards of dead grass. Tree welts formed rings the size of bathtubs that could trap your torso if caught off-guard. We sloshed through the wet, sticky mess while searching for the tape marks affixed in uneven intervals along the route. Fortunately another hiker had tramped through here mere days before, so we prayed that the trace would indeed lead us to the summit and not to a frozen corpse postholed in a neck-deep drift. As expected, the snow depth increased with the rise in elevation. The GPS revealed modest gains in altitude, and around the 900-vertical meter mark we hit our first of many false summits. Being the strongest and most experienced in our group, I lead the way, kick-stepping a ditch through snow the consistency of soft-serve ice cream. Occasionally I’d come across a rope half-buried and spend a few minutes dislodging it: every little bit of landmark would help in the descent, especially if the cloud swept down from above. Deer tracks intertwined with tracks of other unidentified animals. Among them, the undeniable paw prints of a mother bear and cub sent cautionary shivers down our spine. There was no telling how fresh those tracks were, and our only hope rested in the assumption that the den lie safely tucked away in the valley below. At the third false peak we finally got our first view of the summit. Well, at least our first view of the fog snacking away at the summit. Shortly before 1pm we topped out, just as the clouds broke and offered spendid views towards the north. Although Hakusan was away on business, her sister Nogo-Hakusan glimmered bashfully in the afternoon light. The high point revealed a storage shed covered in tin: a rickety, heavily corroded metal ladder sat awkwardly on the eastern side of the unsteady structure. We somehow managed to climb on top without having the building collapse on itself. Having a dry place to devour our lunch was a welcome surprise, as the alternative of a bench of wet snow seemed unthinkable. Once the rice balls and coffee settled, we leapt off the roof and carefully worked our way down the slushy slopes. The barometer remained steady despite the air force of stratocumulus raiding from the north. Rain looked like an imminent possibility until I realized that my sunglasses had intensified the gray tones. Once back on dry land I packed away the eye protection for good and ambled though the serene forest back to the mountain pass and eventually on to the parking lot. As promised, on the way out of town we dropped in to see our caretaker, and he presented us with homemade umeboshi and fukinoto picked from the slopes of Yokoyama itself. With peak #74 successfully under my belt, I looked forward to reaching the magic #75 before the onset of spring.